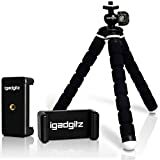 iGadgitz small mini tripod with phone adaptor holder for Apple smartphones. Not suitable for iPhone 6 Plus and 6S Plus 5.5″. Including iGadgitz smartphone mount for tripods and selfie sticks with a ¼ inch-20 screw thread. The bracket is retractable and can fit mobile phones with 56-85mm wide screens. Tripod only 17.5cm in height. Can support maximum weight of 275g. Perfect for both amateur and professional photographers. This entry was posted in Discount Photography and tagged Apple, Black, Bracket, Flexible, Foam, iGadgitz, iPhone, Lightweight, Mini, Mount, Phone, Small, Tripod, Universal by Ball Photo. Bookmark the permalink.